While we will applaud him for coming up with the best baldness cover in history (admit it–you never suspected that beneath that kaffiyeh, there was nothing), other than that, Arafat was filth, and when he moved on to receive his just deserts, we figured “good riddance to bad rubbish.” Now, however, it seems like a creature from a horror movie, he has risen from the grave. Or more precisely, he has been exhumed in order to ascertain if he were poisoned. Now, Jewdar never really cared one way or the other how he went, we were just glad to see him go. So whether it was poison like his admirers say, or AIDS like his detractors say, or whatever natural causes his death certificate says, for us, the critical thing is that once he’s out of the grave, who knows what he may do? On the plus side, if Zombie Arafat does begin to seek out brains, the kaffiyeh makes a great target. This is a hell of a way to treat a Nobel Peace Prize Laureate, Jewdar. That became meaningless when they gave it to Obama–how many Olympic athletes did he have killed? not a fan of arafat, but damn thats just straight up racist! did ‘his brown skin and swarthy features make a great target’ not make it past the editors? Since when did Arafat ever look that good? Adam, you don’t seem to understand–it is a reference to targets, and distinguishing a target. If he were wearing a black and white checked tophat, I would have said “the tophat makes a great target.” If he were wearing a bishop’s mitre, I would have said “the mitre makes a great target.” But he’s wearing a kaffiyeh. Zombies need to be hit in the head to be killed, Adam. His brown skin is irrelevant, and his “swarthy features” are both irrelevant and redundant, since “swarthy” is essentially a synonym for “brown skin.” But shooting Zombie Arafat’s brown chest, for example, would not provide the desired result of killing Zombie Arafat, while shooting Zombie Arafat’s head (easily distinguished by his kaffiyeh), would. Or do you propose a better way to kill Zombie Arafat. If you have one, I, and Zombie hunters everywhere, would love to hear it. Or are you one of those bleeding hearts who believes that Zombies shouldn’t be killed? Zombies should definitely be killed. jewdar, you’re still saying that kaffiyehs (a cultural symbol worn by millions of innocent non-zombies) make good targets. and you’re saying it in the aftermath of israel killing 100+ palestinians in gaza including many women, children, and elderly, none of whom were zombies. imagine if someone was to say ‘yamulkes make a great target’ in the aftermath of innocent jews got killed (such as a hamas rocket attack), and then tried to cover up their clear anti-semitism by claiming they were just talking about zombie jews. Not only were those women and children not zombies, they weren’t wearing kaffiyehs, either, but that’s beside the point, since my post had nothing to do with Gaza, or living Palestinians, but with zombies. In addition to your glaring ignorance on the subject of zombies, you also don’t seem to quite understand the distinction between plural and singular. I did not say “kaffiyehs” make good “targets.” I said this specific kaffiyeh made a good target. That said, if one is attempting to shoot a zombie in the head, kaffiyehs do make good targets. So what? It’s a zombie. As for your suggestion that I maintain a different standard for Zombie Jews than Zombie Arabs, you couldn’t be further from the truth. Adam, as a graduate of Ft. Campbell’s Marksmanship Sniper Course, I would say that if someone were shooting at a Zombie Rabbi, the yarmulke would make an excellent target. Zombie Rabbis are not Jews, they are Zombies. They do not check the hechsher of the brains they are going to eat, they just eat the brains. They don’t even make a brocho. Do you know anything about zombies? By the same token, Zombie Arafat is not a representative of the entire Arab people; he is a zombie, and should be treated the same as any zombie–with a headshot. 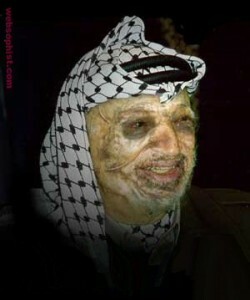 And if I were trying to zero in on Zombie Arafat’s head, the kaffiyeh would make an excellent target. Do I even mention Arabs or Palestinians in my piece? Does the picture depict generic arabs with kaffiyehs? Or does it depict Zombie Arafat? And here’s the big difference between me and you, Adam. If I saw Zombie Arafat about to eat someone’s brains, I wouldn’t hesitate to pop him in the head. I wouldn’t care if the brains belonged to an Arab or a Jew. The important thing to me is that they belong to a living human, and I will value that human life over Zombie Arafat’s un-life any day of the week. What would you do to Zombie Arafat, Adam? Shoot him in the chest in order to avoid being perceived as a racist? Then guess what’s going to happen. Zombie Arafat is going to eat some brains, because the chest shot won’t kill Zombie Arafat. But I’m sure his victim will feel relieved that at least you didn’t shoot Zombie Arafat’s kaffiyeh. Oh no, wait, he won’t, because he’ll be a zombie himself, and won’t feel anything but hunger. Hopefully, that zombie won’t have any culturally significant headgear on. I know Jewdar is not a racist. But I think he IS being a bit sexist. There is NO mention of female zombies anywhere in this discussion. Jewdar doesn’t seem to realize there are many powerful female zombies. They are just as capable of eating brains as any male zombie!! You are right. That was Zombie Phallocentric of me.